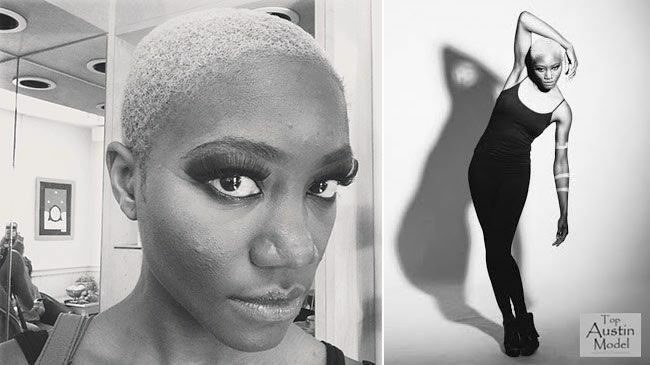 For some of us the decision to big chop can be daunting. We consult our friends, our YouTube feed, our boyfriends, anyone who will listen. But for NaturallyCurly Graphic Designer the choice was an obvious one (and one she'd done twice before). "I feel like I now have freedom to let my hair just be my hair and not something I'm constantly worrying about how to take care of or style. When it was longer I just didn't have the time or ability to style it in a way that felt really polished to me and I like to be able to have that look. My close shaved fade gives me that without me really having to lift a finger. I was a bit nervous leading up to the big chop, because I thought I might regret it since I had quite a bit of growth. But then I realized that caring for longer natural hair just doesn't suit my lifestyle right now. Particularly with my new modeling endeavors, it's a relief to walk into hair and makeup prep for a photo shoot and once my makeup is done, I'm ready—as opposed to spending the entire day before preparing my hair for a 10 minute photo shoot." We all admire Priscilla's confidence to rock her hair just the way she likes it, and to spontaneously dye it blonde on the same day! Watch the video to see the full cut and color, and we'd love to hear your big chop story in the comments!